A man is struck by a bus on a busy street in in New York City. He lies dying on the sidewalk as a crowd of spectators gathers around. Somebody get me a priest!" the man gasps. A policeman checks the crowd----no priest, no minister, no man of God of any kind. Policeman," says the man, "I'm not a priest. I'm not even a Catholic. But for fifty years now I'm living behind St.
Elizabeth's Catholic Church on First Avenue, and every night I'm listening to the Catholic litany. Maybe I can be of some comfort to this man." 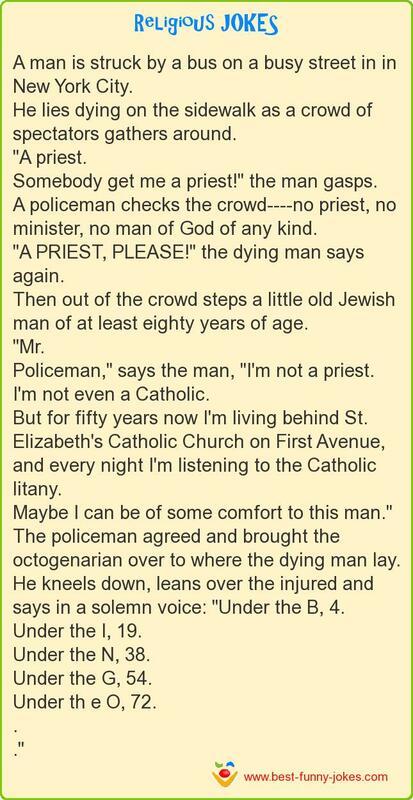 The policeman agreed and brought the octogenarian over to where the dying man lay. He kneels down, leans over the injured and says in a solemn voice: "Under the B, 4. Under th e O, 72.